I just saw these new Herr’s chips the other day at my local Wawa and decided I had to try them. 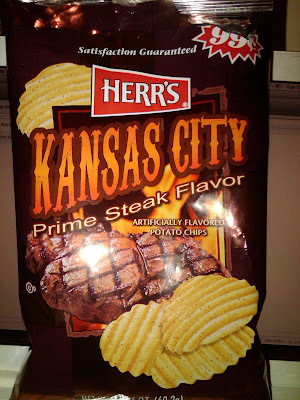 Their full product title is Herr’s Kansas City Prime Steak Artificially Flavored Potato Chips. My first question about these is do they taste like the meat or the stuff that tastes like the meat? Upon reading the back of the bag I learned that Herr’s tops them "with the flavor of thick and juicy steak," a bold flavor hard to find "outside of your favorite steakhouse." Interesting. How exactly does one do that? First things first, the picture on the bag is misleading. 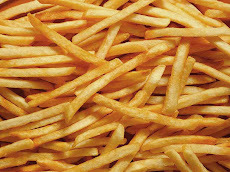 The chips are not wide ripples but tight thin ripples, not waves but ridges in other words. Waves are better for dipping in my opinion, just saying. The chips do in fact have an interesting taste. The pepper is strong and they do have a steak vibe, it’s just not a taste one would expect on a potato chip. It is similar to the phenomenon of Jelly Bellys that have Buttered Popcorn or Bubble Gum flavors – yeah, it’s good but there’s something weird about it in that form. Thee are tasty and different, but maybe not on a regular basis. Well worth a try though. Get Your Potato Head On!